The whistleblowing actions of former NSA employee Edward Snowden have rocked the modern technological world, with its revelations about the organisation’s abilities to tap into our private emails, phone calls, and social media posts to pluck out all possible terror threats, but at the cost of our personal security and privacy. Snowden’s controversial decision to leak these facts to the press was already examined on the big screen in Laura Poitras’s Academy Award-winning documentary Citizenfour, but for the more dramatized version of events who better to turn to than notoriously politically-charged director Oliver Stone? Stone, previously responsible for sparking political debate with films like JFK, Born on the Fourth of July and Nixon, has the prime material and sharp political mind to make Snowden’s story just as conversational and intellectual as many of his other films – but while it has undeniably good intentions, Stone’s Snowden just doesn’t pack as much of a punch as it probably should, coming across more as a well-researched teledrama instead of something that has new things to say about its topic. If you’re not entirely caught up with modern day events, the film is kind enough to give you a basic rundown of the journey that Snowden (played in the film by Joseph Gordon-Levitt) goes on. He starts off training in the army, which a fractured tibia helps end rather abruptly, so the patriotic Snowden goes to work for the CIA, then the NSA, and then the CIA again, during which he learns of several notions by the US government to surveil ordinary citizens in its growing stance on cyberterrorism. 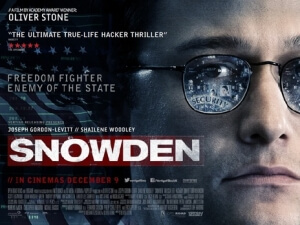 Eventually becoming disillusioned by his government’s intrusive activities, Snowden copies the information onto a hard drive and smuggles it out of the compound where he works, soon afterwards contacting Poitras (Melissa Leo) and journalists Glenn Greenwald (Zachary Quinto) and Ewen MacAskill (Tom Wilkinson) and instructing them to meet him at a hotel in Hong Kong so he can give them all the information they need to run the story. That’s more or less the whole plot of the film, all of which and more you can easily find on Snowden’s own Wikipedia page, which is both a good and bad thing as it keeps the story focused, but doesn’t give the film much that’s new to add to it all. Stone plays things fairly safe here, essentially giving us a smooth and calculated look at how these events actually went down, albeit in a dramatized format, only without the bite that he previously gave some of his other films. It’s interesting, to say the least, but an Oliver Stone film usually aims to be a little bit more than just “interesting”, and you get the feeling that maybe he didn’t quite tackle this particular story in the right way, choosing to be more straightforward instead of really trying to mine an emotional impact from its audience. He’s not really phoning it in, as scenes do still play out with some understanding of tension and build-up, along with Anthony Dod Mantle’s slick digital cinematography that stylises the look of the film with pleasant intensity, but it’s definitely not as strongly motivated as it could have been. That might be also attributed to Gordon-Levitt’s performance as Snowden, which is by no means bad but the actor is clearly lowering his voice slightly to resemble his real-life counterpart, and it can honestly be distracting even in scenes that are to be taken more seriously, as he sounds like a young teenager whose voice has just broken but is intentionally deepening it to mask its squeakiness. His character, as written in the movie, can also sometimes be just a little too obnoxious for the audiences’ tastes, often acting condescending or belittling towards several people, including his girlfriend Lindsay Mills (Shailene Woodley) who more often than not bears the brunt of his demeaning attitude. Snowden himself was involved in the making of this film, and even makes a small cameo in the film as himself, so you have to wonder what he makes of this slightly unflattering portrayal. All of that just makes Snowden an “okay” film, one that will probably be forgotten by many due to its lack of risk-taking, especially with as heavy and topical a subject as this. Honestly, just watch Citizenfour instead; it dives a lot more into the situation, and it didn’t necessarily need actors to make it an impactful watch. Snowden sees director Oliver Stone handle the subject of Edward Snowden and his whistleblowing actions a little too safely for its own good, which doesn’t quite make it as impactful a viewing experience as it probably should have been.